Best business ideas and investment opportunities in Bangladesh for 2019. Here in this article, I’m going to write 10 10 Best Electronics Based Business Ideas for Bangladesh. Electrical and electronics sectors are growing globally with the rapid technology upgrading. And it has opened the door of starting various electronics based business ideas for Bangladesh. These businesses are not only are easy to start but these are very lucrative also. Moreover, while having experience and knowledge any individual can start a business in this field. Besides, these businesses are the most flourishing and extremely diversified sector in the worldwide electrical and electronics industry. This is because we use electronic devices for many daily purposes. For example, we need smartphones to make a call, play games and browse the internet. On the other hand, we need televisions to watch what is happening around the world. Also, there is a great use of computers, printers, etc for our daily life. In short, electronic devices are part and parcel of our life. Like everything that we do on a daily basis, electronic products are always out there to help us. These are regardless wherever we happen to be whether in our own homes or in travel or doing work in our offices. Because electronics is a vast industry involved in the manufacturing, using these electronics based business ideas would be great for you. But, those who have technical skill and knowledge these businesses are perfect for them. Despite these, there are difficulties and obstacles while staring at these businesses, especially when it comes to being successful. Besides, there are many types of businesses in this industry. 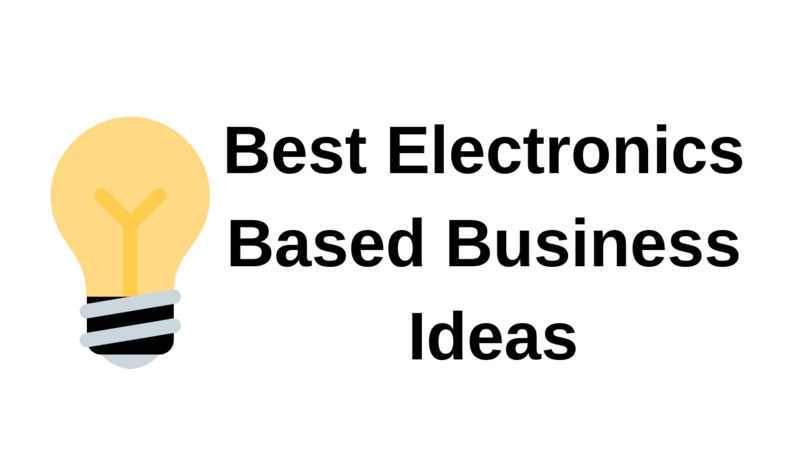 Well, let’s know top 10 best electronics based business ideas for Bangladesh. In the professional and student markets, there is a great demand for laptops, which are amazing electronic devices. Also, the demand for laptops is the growing number of people working from homes as it’s the most interesting trend. This is because it’s one of the best electronics based business ideas for Bangladesh. For the reason that laptops generally are classified as high involvement products, whilst the profit margin involved in each sale might not be as good as one expects but even a single sale can make your day. And you should make a list of brands that sell better in your locality and then procure the sample supply from the dealers prior to starting a laptop retail shop. Computer repair services are potential for those who own laptops and computers. As a matter of the fact, computers can’t always resist faults such as sudden shutdowns, motherboard, and several other hardware and software related failures. Many people have no knowledge of how to repair troubled computers while some are able to fix such failures on their own. And in this place, you can show your skills of repairing faulty computers help you earn money. This business needs a combination of repair skills, quality components, and repair tools. And these all made it one of the best electronics based business ideas for Bangladesh. As the day in and day out, we need smartphones for making routine, important and emergency calls, surfing the internet, chatting with friends and various important tasks. And this is why life becomes boring for a moment when our smartphones turn switch off. These needs are for all people of Bangladesh and it’s a good idea to open a Smartphone retail business. But, remember that you can put up for sale in your shop when you have brands with high local and current demand should be sourced from respective dealers. If you’re thinking to start Smartphone repairing services then you should thank the Smartphone companies that have worked hard over the years to bring down the prices of smartphones. This is what has enabled almost everyone from rich to poor to own a Smartphone. And when bringing with it Smartphone aftermarket it involves Smartphone repair and maintenance services. Also, smartphones sometimes run out of juice and that is when cellphone technicians are called upon just like computers. Although there are even many who have more than one, everyone knows the fact that today almost all people own at least one mobile. That’s why you might want to start a smartphone repair business if you have skills to repair faulty smartphones. And this is one of the best electronics based business ideas for Bangladesh. Since people have shifted to flat and high quality LED and LCD sets, the CRT television sets that once had a defined place in our homes have almost disappeared ever. Because there is a great use of LCD and LED TVs, it’s a great idea to start LCD and LED repair business. And if you know how to repair defected LCD and LED sets or keep a technician in your shop then you could generate more profits while providing LED and LCD repair services. And it could be a great source of income as it’s one of the best electronics based business ideas for Bangladesh. Due to the emergence of security problems CCTV cameras have become a necessity today. They not only need for residential places but commercial places as well. That’s why starting CCTV camera business in your locality would be one of the great electronics based business ideas for Bangladesh. It’s worth for you to open a solar lights retail business there if you live in a place where people face electricity deficit most of the time. And as electricity has a great problem in Bangladesh, you can start selling solar lights. You can make your business more attractive and profitable if you offer to repair services to your clients. It’s better with a shop where you can sell and repair them. But, skills in order to deliver effective services to your clients, it’s utmost important that you guard yourself with repairing skills.